Two months after the inauguration of U.S. President Donald Trump, the College of William and Mary is voting for a new Student Assembly president. In these two months, the campus has been the site of protests, letter-writing campaigns and efforts to spread awareness about how federal policies could impact international students and those students protected under Deferred Action for Childhood Arrivals. 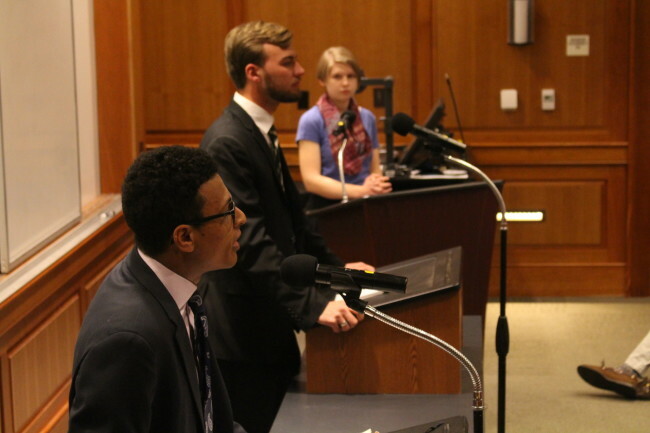 According to SA presidential contenders Elijah Levine ’18 and Chairman of the Senate Danny O’Dea ’18, these policies have, in some ways, shaped their campaigns. Each has worked with student groups addressing policies like Trump’s executive order, which created a 90-day ban on immigrants from seven Muslim-majority countries. Both candidates have platforms that specifically address the College’s role within the international community. Levine and his vice-presidential running mate, Sen. Annelise Yackow ’18, have a section of their platform dedicated to diversity, which includes their goals for supporting international students. If elected they’d like to hold the College accountable for supporting the City of Williamsburg’s proposed refugee resettlement resolution, securing DACA provisions and becoming a sanctuary campus for undocumented students. In these last two months, the College has published information through the Reves Center for International Studies on how it would respond to a request to comply with a federal warrant or other immigration matters. The College has also signed the second iteration of a letter, drafted by college presidents, declaring their support for an end to such executive orders. However, according to University Spokesperson Brian Whitson, because the College is a state institution, it will follow the Virginia General Attorney’s guidance for becoming a sanctuary campus, which is not something Whitson said is possible according to current guidance. Levine said that while he knows it is unlikely the College could stop a U.S. Immigration and Customs Enforcement agent, he believes discussing the College’s status as a sanctuary campus is an important conversation to have. The City’s refugee resettlement resolution is something that was first introduced in the City Council with support from Amnesty International before November’s U.S. presidential election. If passed, it would codify the City’s support of welcoming refugees into Williamsburg. Yackow said that one factor for a delay in passing this was pushback from Williamsburg residents who were not in support of the resolution. Yackow said that if elected, she and Levine believe that because students make up approximately 33 percent of Williamsburg’s population, they should be able to advocate for City policies. While this resolution was initially brought to SA President Eboni Brown ’17 for support, Yackow said that the time is better for SA support now, because it is more removed from the election and inauguration of Trump. While Levine said that Trump’s inauguration has influenced what was prioritized in his platform, he thought it was important to acknowledge that many communities, like those of people of color, were not surprised by Trump’s election. O’Dea and his vice-presidential running mate Nami Srikanth ’19 include a section in their platform on increasing the College’s focus on international students that encourages “increasing an outreach … with an emphasis on the fact that international students are a welcome and valuable group on campus.” While their platform does not specifically mention refugees or students protected under DACA, O’Dea said he has been working with student groups to publish an amendment to their platform. One student, Nairuti Shastry ’17, who is leading the College’s Books Not Bombs campaign, said she worked with O’Dea to help shape this amendment to his platform.